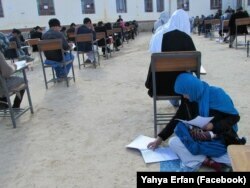 KABUL -- Jahantab Ahmadi had never heard of Facebook before this week, when an image of the Afghan mother of three nursing her baby during a university entrance exam took social media by storm. This image of Jahantab Ahmadi nursing her infant daughter while taking a university entrance exam in Afghanistan went viral. Sabawoon Kakar is a correspondent for RFE/RL's Radio Free Afghanistan in Kabul.